2010 Southwest Rice Tour – May 26, 2010. Will begin at Fenton Co-Op in Fenton, La. For more information please contact County Agent Barrett Courville at bcourville@agcenter.lsu.edu. I hope to see you there! 11:25 – 11:35 Rice Insect update, Dr. Natalie Hummel, LSU AgCenter, Entomologist – at this location I will discuss a demonstration test comparing untreated seed to seed treated with either CruiserMaxx or Dermacor X-100. After wrapping up at the Hoffpauir farm, Barrett and I headed over to Jeff-Davis Parish to take stand counts at the demonstration that Mark Pousson has planted. The rice is coming along nicely. At this location, the seed treatments are planted side-by-side in the same cut. This allows us to easily observe any differences in plant height, vigor, or stand thickness between treatments. As we were taking stand counts, Barrett observed that if you stood on the edge of the field you could easily see a difference between the untreated seed and the CruiserMaxx treated seed. I took a few pictures. 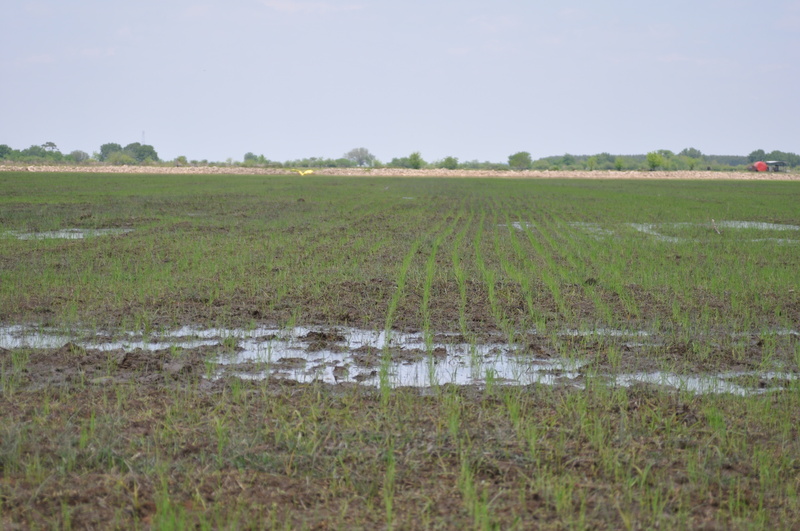 Rows of rice grown from untreated seed (no insecticide treatment) in comparison to CruiserMaxx treated seed. The rows are much more visible in the CruiserMaxx treated area. In the picture above, the untreated area is to the left of the center, while the CruiserMaxx treated plants are to the right. We don’t know if this will translate to a difference in yield, but it is interesting to note the difference in plant vigor in the early season. While walking through the field, we also noticed some interesting clusters of eggs. 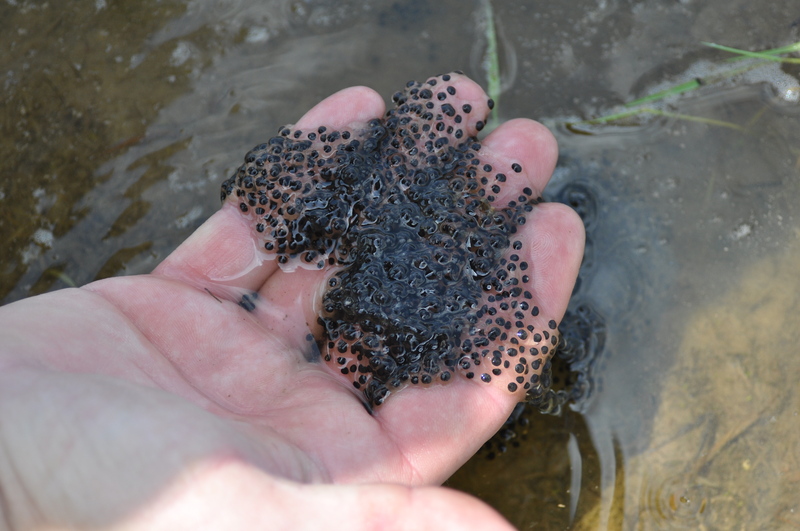 Egg mass in the water. Barrett held the egg mass in his hand for a closer look. 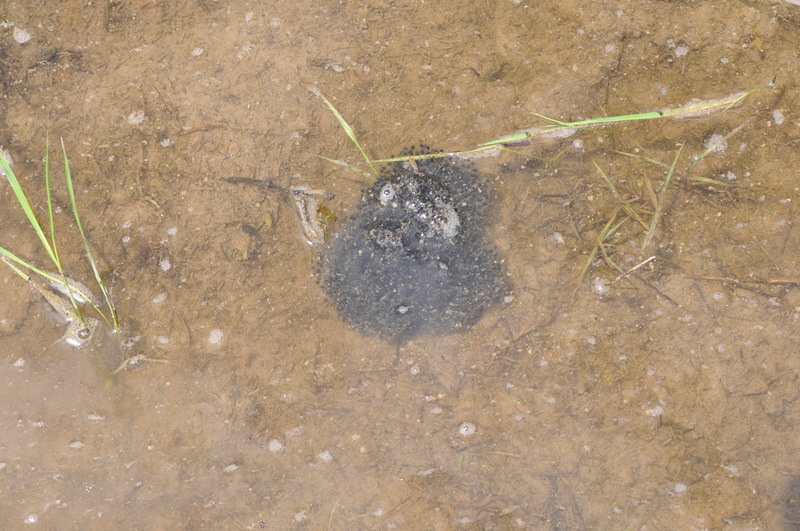 I’m not sure if these are frog eggs, but that’s what they look like. This is a nice reminder of the important job that rice fields serve as a home for a variety of wildlife. It’s a great working environment for a weekend naturalist.